If there’s one kitchen unit that we’ve talked about a lot, and we’ve talked about MANY, it’s your kitchen worktop. As a main feature in your kitchen, you can’t afford to brush over your choice of material, especially when you consider the action it’s going to see! Food preparation, cleaning, hot pots and plates being put on it… you have to make sure you’re picking the right style for your daily life! Luckily, there are plenty of different worktops to choose from and we’re here to give you a helping hand! Let’s take a look at what you should consider before buying your kitchen worktop materials. Before you plan ANYTHING, make sure you know what you can afford. Different worktop materials come in at drastically different price points so make sure to consider what it is you want and if you’re going to be able to save for it. In general laminates are at the cheaper end of the spectrum whereas granites and marbles will be pricier. If you don’t have the money for more expensive materials, don’t worry. Regardless of your budget, there are plenty of great, stylish kitchen worktop options to choose from. You can always mix and match your worktop materials, using more expensive, harder materials in areas where more work will be done and use laminate everywhere else. Not only is mixing worktop materials very on trend right now, but it’s perfect for getting the feel of a higher end kitchen without having to blow your entire savings. The size and shape of your kitchen is also going to be a big factor in what kind of worktop you’ll be able to have. If you have a lot of corners and or built in features that will have to be worked around then fitting is going to be a lot more expensive. This is wear having a a composition of different worktop materials will come in handy, especially if you’re on a tight budget. If you’re working with stone or marble, then every individual cut out is going to cost you, so make sure you know where you want each piece and stick to cheaper materials where you can. We could go on all day about the different worktop materials that are available to you… but that would be an EXTREMELY long and arduous blog post. So for now, we’re going to give you a quick summary of all the best materials so you can see which will work best in your kitchen space. A composit worktop is comprised mostly of quartz crystals, but is also mixed with ‘binders.’ This gives the material its characteristic hardness, making it resistant to stains, scratches, heat damage and basically anything else you can throw at it. Thanks to those natural binders mixed in, it’s much more of a consistent material than 100% stone so you won’t have to worry about variations in the colour or strength in the different pieces. As a material, it can used anywhere in the kitchen and, in the unlikely event it’s scratched, imperfections can easily be sanded out. If you’re going for a more rustic vibe or would really just like to add some warmth to your kitchen, you can’t go wrong with a hardwood worktop. While softer woods like pine can also look great, hardwoods are more often favoured for their natural strength and durability. Hardwood is a very flexible material design-wise and can be used in almost any kind of kitchen design. Thanks to its nature as a material, it’s also easy to cut to size, so is a great choice for those sticking to a smaller budget. If you’re looking to mix and match worktop materials, make sure to keep your hardwood to places in areas where food will be prepared or around the sink as many hardwoods have a high oil content and so are resistant to water. While it is a strong material, just make sure not to go overboard. It may be wood, but it doesn’t mean you can use it instead of a cutting board and leaving hot pots directly on it for too long could scorch it. 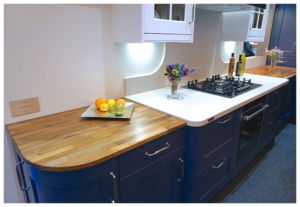 The best choices for a hardwood kitchen worktop would be walnut or oak, though always to remember ask your kitchen designer or fitter what they would recommend. If you’re on a budget, then a laminate worktop is for you! While it’s at the lower end of the price range, it doesn’t mean you don’t have a wide range of styles too choose from, plus it’s more durable than you might think. While it’s cheaper than other worktop materials, it’s still a great kitchen worktop material thanks to it being non-porous in nature, easy to maintain and resistant to both scratching and water damage! Coming in a wide range of styles and colours, laminate can work well in any kitchen design and is perfect for filling in space if you’d rather mix and match a few different worktop materials. It’s also one of the few materials that doesn’t need a professional to cut and fit it, though we’d always advise you get someone who really knows what they’re doing to do anything in your kitchen. After all, you’ll be paying twice as much to fix it if something goes wrong. If you’re looking for strength, then a granite worktop simple cannot be beat! As one of the strongest natural materials, a granite worktop is both stain and scratch resistant as well as able to withstand high temperatures and water damage. One of the selling points of granite is the unique finish you will get. Natural stone is very beautiful in general but with granite, each slab will also have own unique colouring and veining. This means if you choose a granite worktop, it’ll really be your own personal design as no two pieces of granite are the same! It also works well in a number of styles as it’s been around for so long! Whether you want a classic polished finish or a more matt surface in a contemporary kitchen, granite can get you there. While it is a great material, you are a little more limited when it comes to colours and if you keep it for a long time, it will need resealing after ten years to prevent additional damage. We’ll round off with a worktop material that often gets forgotten: glass. It’s a favourite of designers in general because of the light, chic touch it can bring to a kitchen. It’s also a great way to brighten a design due to its reflective nature. Perfect if you don’t get a lot of natural sunlight in your space and want to maximise the power of your lamps. Since it’s a non-porous material, it also means most stains will wipe off easily. Plus, glass for kitchen worktops have been chemically toughened, so you don’t have to worry about it shattering if you drop a pan on it. While glass unfortunately isn’t entirely scratch resistant, most nicks and imperfections can be polished down. Plus you can keep it shiny with just a few squirts of glass cleaner! Thinking about investing in a new worktop? How about a kitchen redesign in general? Make sure to have a read through the rest of our blog for more helpful insights on style, colour and design! Our customers reviews are pretty amazing too so pop over to Roman Kitchens and let us create your dream kitchen. Or, if you have time, come on down to our Essex showroom and we’ll be glad to advise you in person!